The past two decades have seen a significant change in how the U.S. and the world powers its homes, businesses, factories, and vehicles. At the forefront of this dramatic shift has been the growth of renewable energy (primarily solar and wind), the recent rise of energy storage and EVs, and the advent of smart and connected electric grids. 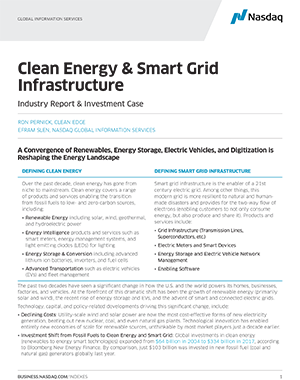 Published by NASDAQ in collaboration with Clean Edge, Clean Energy & Smart Grid Infrastructure: Industry Report & Investment Case describes the trends and developments impacting these dynamic industries. Download the full report (13 pages).